One average size grapefruit contains 100 calories and 4 g dietary fiber. Grapefruit also contain vitamins A and C.
Grapefruit contain a soluble fiber known as pectin which lowers high cholesterol levels and therefore prevents heart disease. 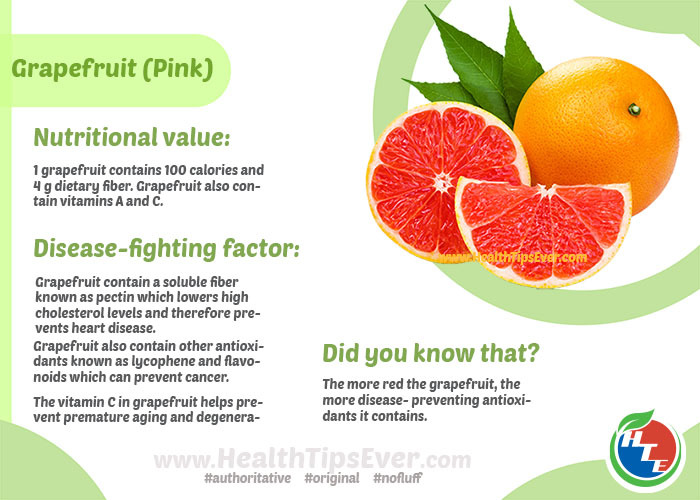 Grapefruit also contain other antioxidants known as lycophene and flavonoids which can prevent cancer. The vitamin C in grapefruit helps prevent premature aging and degenerative diseases. The more red the grapefruit, the more disease- preventing antioxidants it contains.